1.1 Output: Continuous 18A, burst 50A. 1.2 Input: 4-9 cell NiMH/NiCd or 2-3S LiPo. 1.3 BEC: 6V/1A (Linear mode built-in BEC). 1.5 Motor Supported: Sensorless Brushless Motor. 1.7 Suitable Car: 1/18 on-road sport. 1.8 Cooling Fan: Not included. 1.9 Size: 31.5mm(L) * 27.5mm(W) * 15mm(H). 2.1 Compatible with sensorless brushless motors. 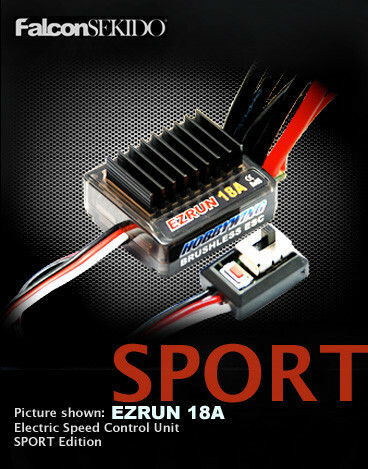 2.2 Top quality components, high current endurance. 2.4 Many programmable items. Suitable for various chassis, tires and racing tracks. 2.5 Multiple protection features: Low voltage cut-off protection / Over-heating protection / Throttle signal loss protection. 2.6 Internal timing can be changed easily to make the ESC suitable for various motors. 2.7 Easily programmable with the SET button, Professional LCD Program Box and USB Link Software. 2.8 ESC firmware can be updated through the USB adapter in the LCD Program Box. The options in italic font in the above table are the default settings of the ESC.